Jam is normally prepared from ready made pulp. 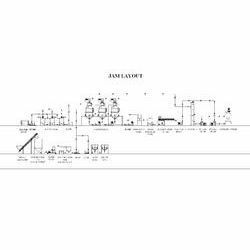 We offer automatic and semi-automatic plants for jam processing that include machines for sugar syrup preparation, mixing tanks for mixing pulp and sugar syrup, vacuum evaporation or open kettle evaporation etc. The number and size of machines depends upon the capacity of the plant.Jam is normally filled in glass bottles. We offer fully automatic filling machine for jam filling consisting of automatic jam filling machine, feed conveyor, discharge conveyor, lug capping machine etc.